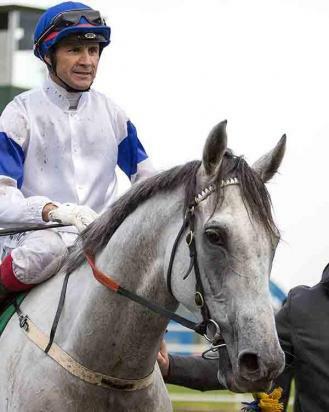 BRADBURY'S LUCK (AUS) (Grey 2002-Stud 2006). 2 wins at 2, GCTC Magic Millions 2YO Classic S., RL. Sire of 257 rnrs, 176 wnrs, inc. SW Luckygray (WATC Railway S., Gr.1), Fire Up Fifi, In Cahoots, Cash Luck, Avaladyluck, She Can Skate, Ringa Ringa Rosie, SP Col 'n' Lil, Unimpeachable, Goldslick, Skating on Ice, Chewychop, Sunshine Rhythm, In a Tangle, King Utah and of Rising Luck, Queen of the Lochs, Rusty Colours, It's a Bit Shady, etc. LUCKYGRAY (g. by Bradbury's Luck). 14 wins. See below. Natural Luck (g. by Natural Destiny). Winner at 1200m in 2014-15 in Aust. DIEGO GARCIA - MY ETERNAL FLAME (Mac.) (Catbird). 13 wins-3 at 2-from 1100m to 1650m, A$320,800, HK$6,725,250, M$1,057,040, to 2014-15 in Aust., HK and Macau, STC Todman Slipper Trial S., Gr.2, AJC Canonbury S., L, STC Shamrock 2YO H., HKJC Choi Hung H., Happy Valley Vase H., Cornwall H., 2d Hong Kong Macau Trophy, HK-3, HKJC Chinese New Year Cup, Fakei Cup, Amber H., Taipa H., Cornwall H., 3d AJC Up and Coming S., Gr.3, HKJC Premier Cup, HK-3, National Day Cup, HK-3, High Island H., Atlanta H., Cheung Sha H., Asia H., Macau Sinkiang H., 4th AJC Royal Sovereign S., Gr.2. Supremist. 2 wins at 1400m, 1550m, STC Camden RSL H., 2d AJC Research H., STC Action Workforce H., Golden Slipper Festival H., 3d AJC Wiggle H., Grenoble H., STC Trentham H., Rydges North Sydney H.
Reign On. 3 wins from 1500m to 1750m, 2d MRC Lobster Cave P.H. Lady Zel. 7 wins to 1400m in Aust. Damah Lady. 4 wins. See above. Fyfield. 4 wins to 1200m in Aust. Shylany. Winner at 1300m in Aust. Arwoc. 4 wins from 1600m to 3300m, A$85,290, to 2014-15 in Aust. Cote Normandie. 5 wins from 1000m to 1600m, SAJC Super 66 H., Adelaide Casino H., Yalumba Wines H., VATC Counsel Welter H., 2d VATC Katandra H., 3d SAJC Greshams Bar & Grill H., 4th Onkaparinga RC Adelaide Casino S., L.
DELIRIOUS (Bellotto). 7 wins from 1100m to 1800m, A$330,850, VATC Lord S., L, VRC Rowland Sodexho Sprint H., VATC Safeway The Fresh Food People H., Robert Hunter H., New Gleam H., VRC Winter Championship Heat 1 H., 2d VRC Hilton on the Park Sprint H., L, Nokia Welter H., VATC Melbourne FC H., VRC Geoffrey Levett H., 3d VRC Bobbie Lewis H., Gr.3, Winter Championship H., L, VATC Holt Welter H., 4th MVRC Alister Clark S., Gr.2, VATC Autumn Classic, Gr.2. Blazing Devil. 3 wins at 1400m, 1600m, AJC Scobie Breasley H., 2d AJC Pharos H., SAJC AGC H., 3d AJC Alan Potter H., 4th VRC Gibson Carmichael S., L.
Pine Lodge Lady. 2 wins. See above. Jesterville. 4 wins at 1000m, 1100m, WATC Seaview Glass Mountain H., Aptofine H., Lin Ryan H., Van Donton H., 2d WATC Rare Flyer H., Penang Turf Club H., Orioles H., Alfred Cove H., Todvega H., Claremont Bowling Club Centenary H., 3d WATC Mount Franklin Spring Water H., Harvey Deegan H., Super Sam H., 4th WATC Placid Ark S., L.
Lester Thunderwing (Last Tycoon). 7 wins from 1400m to 2700m, A$208,800, VRC Riding for the Disabled Cup H., BTC Lexus RX400H Cup H., MVRC Gegabar H., SAJC Cadbury Schweppes H., 3d South Australian Derby, Gr.1, Qld Tatt's RC Tattersall's Cup, Gr.3, VRC Duke of Norfolk S., L, MRC Wallace H., 4th VRC Saab H., Gr.2, Ipswich Cup, L.
Race Record: 30 Starts 14-3-0 A$2,677,525. 14 wins from 1200m to 1800m, A$2,677,525, to 2014-15, WATC Railway S., Gr.1-twice, Kingston Town Classic, Gr.1, Lee Steere S., Gr.2, Roma Cup, Gr.3-twice, Belmont Sprint H., Gr.3, Hyperion S., Gr.3, Asian Beau S., Gr.3, Air & Water Residential H., Westspeed 3YO H., Perthracing.com.au H., Paul Fletcher Commercial Lawyers H., Club Burswood H., 2d WATC Railway S., Gr.1, Kingston Town Classic, Gr.1, Magic Millions Perth 3YO Trophy, 4th MVRC William Reid S., Gr.1, MRC PB Lawrence S., Gr.2, WATC Lee Steere S., Gr.2, Roma Cup, Gr.3, Challenge S., L.